This topic provides an overview of the structure and components of Diego, the container management system for Pivotal Cloud Foundry versions 1.6 and newer. Cloud Foundry uses the Diego architecture to manage app containers. Diego components assume app scheduling and management responsibility from the Cloud Controller. See the following diagram and descriptions for information about the way Diego handles app requests. 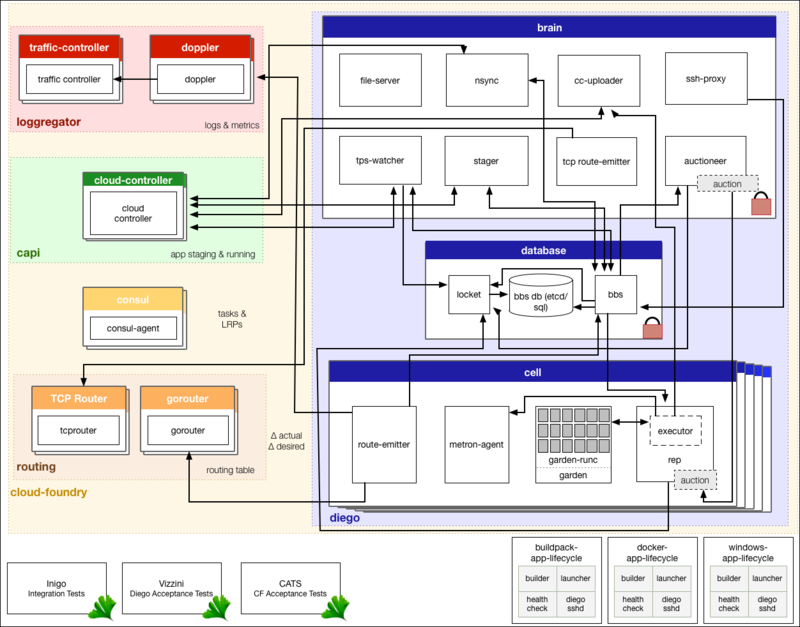 The Cloud Controller passes requests to stage and run apps to several components on the Diego Brain. The Diego Brain components translate staging and running requests into Tasks and Long Running Processes (LRPs), then submit these to the Bulletin Board System (BBS) through an API over HTTP. The BBS submits the Tasks and LRPs to the Auctioneer, part of the Diego Brain. The Auctioneer distributes these Tasks and LRPs to Cells through an Auction. The Diego Brain communicates with Diego Cells using SSL/TLS protocol. Once the Auctioneer assigns a Task or LRP to a Cell, an in-process Executor creates a Garden container in the Cell. The Task or LRP runs in the container. The BBS tracks desired LRPs, running LRP instances, and in-flight Tasks. It also periodically analyzes this information and corrects discrepancies to ensure consistency between ActualLRP and DesiredLRP counts. The Metron Agent, part of the Cell, forwards app logs, errors, and metrics to the Cloud Foundry Loggregator. For more information, see the Application Logging in Cloud Foundry topic. Diego components run and monitor Tasks and LRPs. Diego Brain components distribute Tasks and LRPs to Diego Cells, and correct discrepancies between ActualLRP and DesiredLRP counts to ensure fault-tolerance and long-term consistency. See the Auctioneer repository on GitHub for more information. See the CC-Uploader repository on GitHub for more information. This “blobstore” serves static assets that can include general-purpose App Lifecycle binaries and app-specific droplets and build artifacts. See the File Server repository on GitHub for more information. See Application SSH, Application SSH Overview, or the Diego SSH repository on GitHub for more information. See the TPS repository on GitHub for more information. See the Nsync repository on GitHub for more information. See the Stager repository on GitHub for more information. Diego Cell components manage and maintain Tasks and LRPs. See the Rep repository on GitHub for more information. See the Executor repository on GitHub for more information. See the Garden topic or the Garden repository on GitHub for more information. See the Metron repository on GitHub for more information. See the Route-Emitter repository on GitHub for more information. The Diego database VM consists of the following components. Provides an RPC-style API over HTTP to Diego Core components and external clients, including the SSH Proxy and Route Emitter. See the Bulletin Board System repository on GitHub for more information. The Diego BBS stores data in MySQL. Diego uses the Go MySQL Driver to communicate with MySQL. See the Go MySQL Driver repository on GitHub for more information. See the BOSH DNS documentation for more information. Garden contains a set of interfaces that each platform-specific back end must implement. See the Garden topic or the Garden repository on GitHub for more information. The Builder, which stages a CF app. The Builder runs as a Task on every staging request. It performs static analysis on the app code and does any necessary pre-processing before the app is first run. The Launcher, which runs a CF app. The Launcher is set as the Action on the DesiredLRP for the app. It executes the start command with the correct system context, including working directory and environment variables. The Healthcheck, which performs a status check on running CF app from inside the container. The Healthcheck is set as the Monitor action on the DesiredLRP for the app. Buildpack App Lifecycle implements the Cloud Foundry buildpack-based deployment strategy. Docker App Lifecycle implements a Docker deployment strategy.